My name is Paul Bruns and I live in Bridgewater Massachussetts. It is quite an honor to have my aquarium featured here in Advanced Aquarist. I have been keeping aquaria in one form or another for over 40 years so it’s a thrill for me to be asked to display my reef here. Since its setup almost eight years ago there have been many changes to my system and reef . In this write up I will try to explain what I have done and why. I also hope to convey the wonder and great pleasure I experience with this hobby. My reefkeeping philosophy can be summed up as having two priorities. First and foremost is the welfare and health of the animals under my care. I would do almost anything for them. Secondly, I like to pay a lot of attention to the aesthetics, beauty and presentation of the aquarium to make the viewing experience the best I can make it. I know that the main focus should ultimately be about what is inside the tank. However, I think the appearance of the entire setup and the room it is located in can have a big impact on the viewer. As the aquarium is in the middle of my home I think this is very important. My present system is the product of what I learned from the many that came before it. I used that experience to create what I think is a unique viewing experience of a beautiful reef in an unconventional room. The tank itself is 427 gallons. It is eurobraced acrylic with a center overflow made by Invisions Inc. 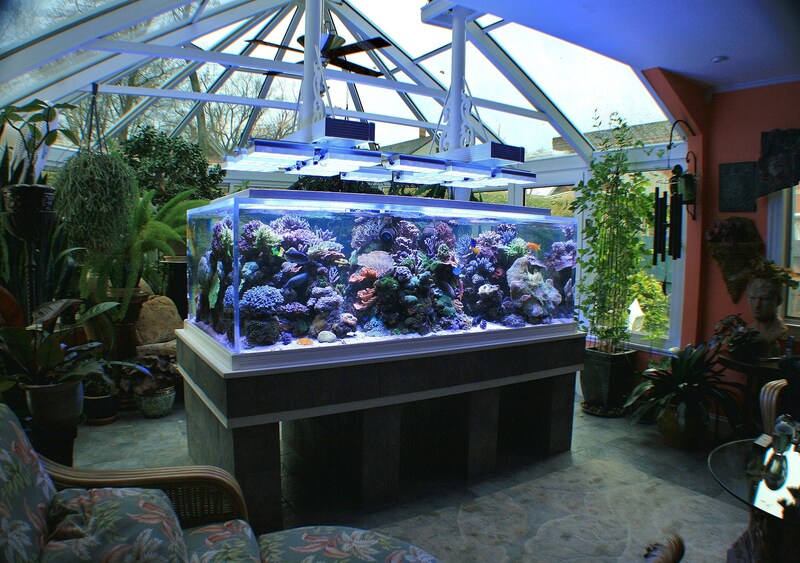 The tank measures 84″ x 36″ x 29″. The center overflow allows for unobstructed viewing from all angles of the room. Building the stand was a challenge because I generally dislike the look of all conventional aquarium stands. I wanted something that I could see through and would not appear boxy. The stand is made of 4 columns of cinderblock topped with 3 steel I beams and 3/4″ plywood. The columns and sides were tiled over with the same tile used for the floor of the room. This helps the stand fade from view instead of standing out. I have had guests jump with shock when one of my dogs comes walking out from under the stand to say hello. All the plumbing and electrical are routed through the legs of the stand to the sump in the basement below. 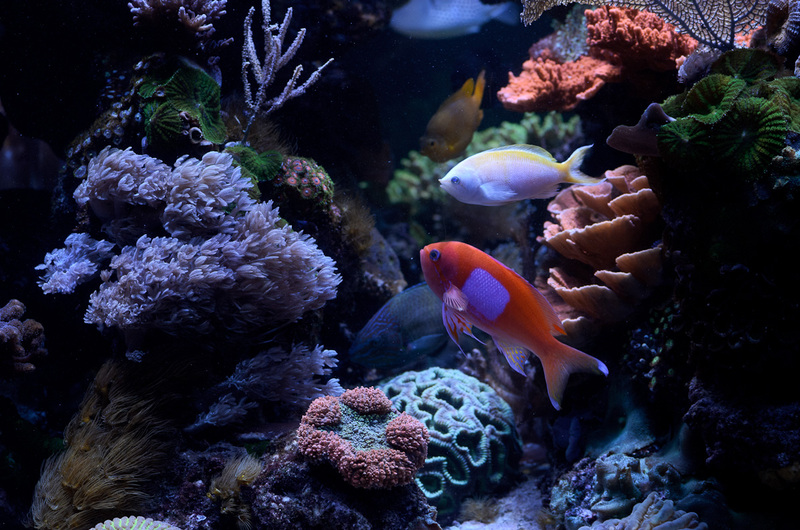 I don’t think there is any kind of aquarium filtration method I haven’t tried or used. All are useful and have their applications. 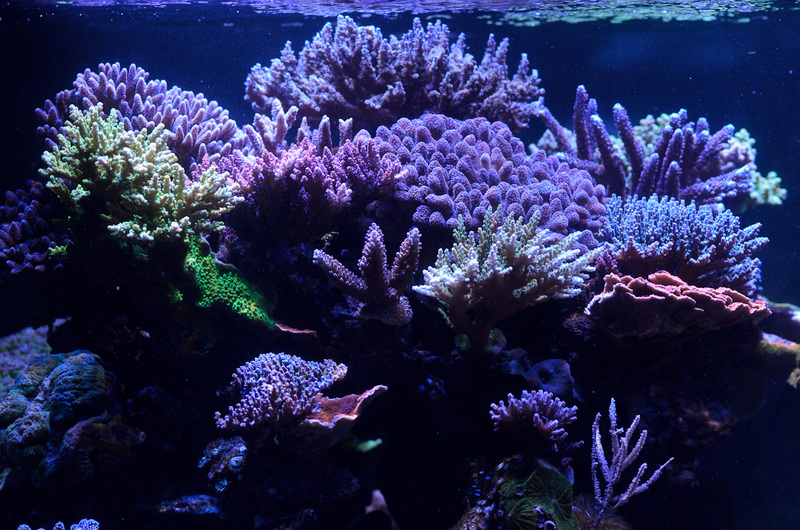 I have found that no single method alone of nutrient control is sufficient to handle the bioload of my reef. I have gone through a progression of methodologies over the past eight years. I used ozone for a while but found keeping the air dry for it problematic. I had a remote deep sand bed when I originally set up the system. At around the second year nitrates began to rise and I realized this method of nitrate control just wasn’t working anymore. I switched to vodka dosing and bought a sulfur denitrator. That worked, but what a pain! Daily additions of vodka were tedious. The reactor worked well but I didn’t like the adjustments I had to make to it as nitrate levels of the water fluctuated. I also had a persistent problem with phosphates. I used GFO and dripped lanthanum chloride into filter socks and a diatom filter. GFO was expensive and often caused STN on my acros when I changed them. Lanthanum dosing was a real chore. Through a lot of experimentation and lots of trial and error I eventually found success. A combination of a good skimmer, carbon dosing (biopellets) and an Algae Turf Scrubber keeps the nutrient levels of my water very low. I can feed large amounts of food without worry. The skimmer is a Bubble King 250 Internal. The biopellets tumble in a NextReef reactor. The algae Turf Scrubber I made myself. Originally I had two Maristar fixtures with four 250 watt halides and four 39 watt T5s. 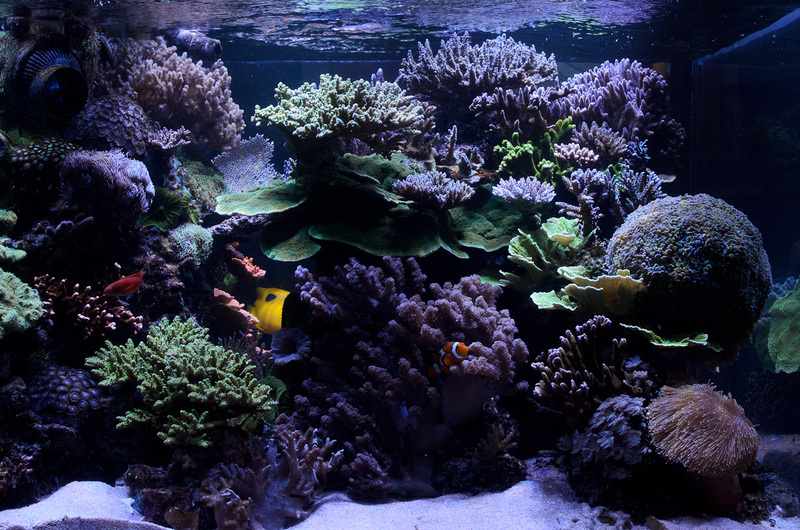 I also used some 12″ Finnex T5 fixtures to try and light up some of the darker areas of the tank. This lighting configuration was used for 6 years. It was not entirely successful as there were dimly lit areas of the tank and all those fixtures hanging above looked pretty poor. In 2011 I upgraded the lighting to 12 Aqua Illuminations Sol Blues. Since that time I have added 2 more. 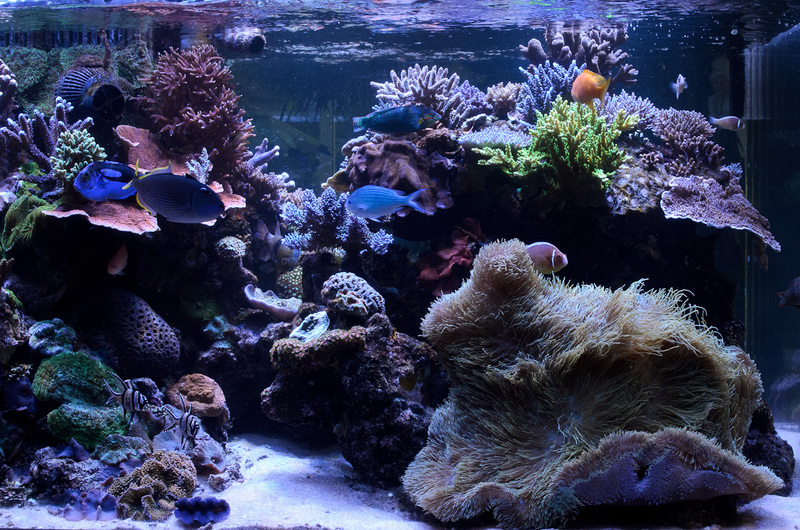 The difference has been dramatic for my corals and the overall look of the tank and room were remarkably enhanced. I have some advise for anyone that is thinking of changing to LED lighting. Measure the intensity of your present system with a par meter or lux meter. I used a lux meter. When you put up your LEDs, match that intensity as best you can and slowly change from there. There are five Tunze Stream Pumps. Three are attached to Vertex Moceans that sweep back and forth across areas that are mostly populated with SPS. Three others are in fixed positions. All are mounted on the center overflow. 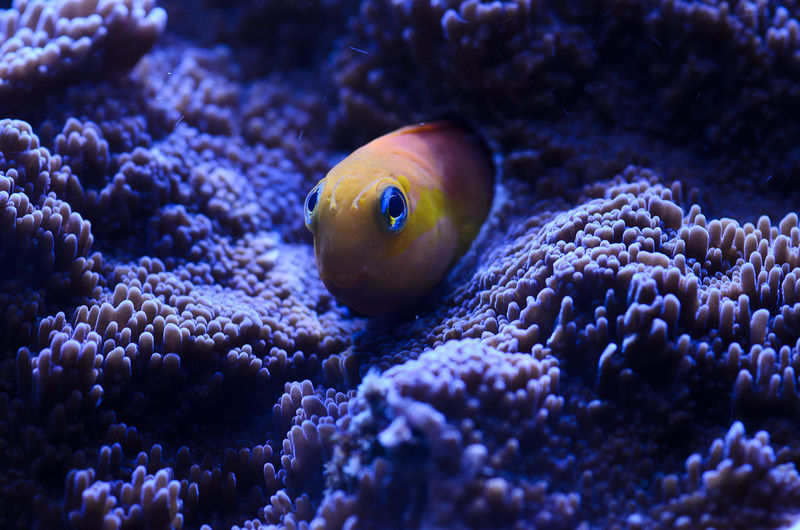 The return pump is a Reeflow Goby Gold and is located with the sump in the basement. Believe it or not, cooling has never been a big issue, even in a sunroom. 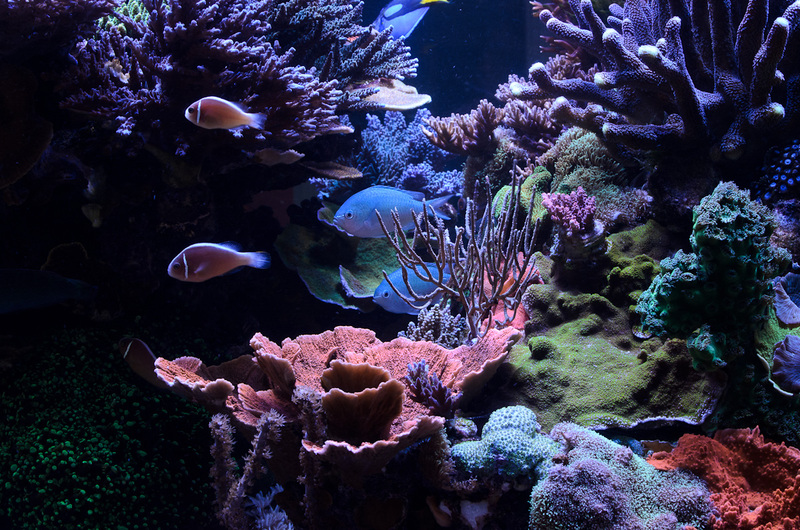 When the temperature of the water reaches 80.0F, a fan on the wall adjacent to the tank blows air across the surface of the water. Even with the air temp of the room at 86F, the tank temp has not exceeded 80.2F. With the new AI lighting, the room stays a lot cooler and the AC runs a lot less. There are two 500watt titanium heaters in the sump for heating. In the winter the sump and everything I can reach are insulated. I have an Apex Lite controller but this is relatively new and is not completely configured. It presently controls the heaters, the cooling fan, the lights on the ATS and some air pumps. I will get an e-mail and text message if the power fails or if the pH or temperature go out of range. The specific gravity and top- off are controlled by the SeaVisions Dialyseas, which is described next. I thought a lot about maintenance when I was planning this tank. I ended up buying a Dialyseas made by Seavisons. I was very tired of doing water changes and I knew a tank of this size would need sizable and frequent ones. The Dialyseas does all the water changes for me. I just add the salt of my choice to the brine bucket. I can set how much water I want changed on a daily basis. Right now I have it set low, only 1.5 gallons a day. The Dialyseas also makes all the RO/DI water I need and monitors the specific gravity with a conductivity meter. It makes adjustments when needed and is amazingly stable and accurate. Here is a link to a vid that shows the basement sump and equipment. The algae turf scrubber is scraped once weekly, usually on the weekend. I get a large dinner-plate full of algae every week. I replace 2 cups of carbon in the carbon reactor (an old converted calcium reactor) every third week. I add one large spoonful of calcium hydroxide to the kalk stirrer every night. I clean the acrylic almost every day, but that is because I have OCD when it comes to my tank. The Tunze powerheads get bleached and vinegar dipped when needed. I utilize both a calcium reactor and a kalk stirrer to keep up with the demand. The calcium reactor is made by Schuran and the kalk reactor by Aqua Medic. A Spectrapure LitreMeter pulls RO/DI water through the kalk reactor for all top-off. Lugols Iodine, 8 drops daily. A sheet of nori and a cube of cyclops are fed in the moring while I have my coffee. At 10 AM, 5PM and 8PM an automated feeder dispenses various pelletized dry foods. Around 2 PM I feed 10 cubes of frozen mysis and one cube of cyclops. Both my Rabbitfish and my Hippo Tang lost parts of their fins on their introduction to the tank. I do not know what the cause was, and neither fish regained what was lost. The Hippo Tang is the Edward Scissorhands of the reef and looks like he went through a blender. He is very healthy though and continues to grow. 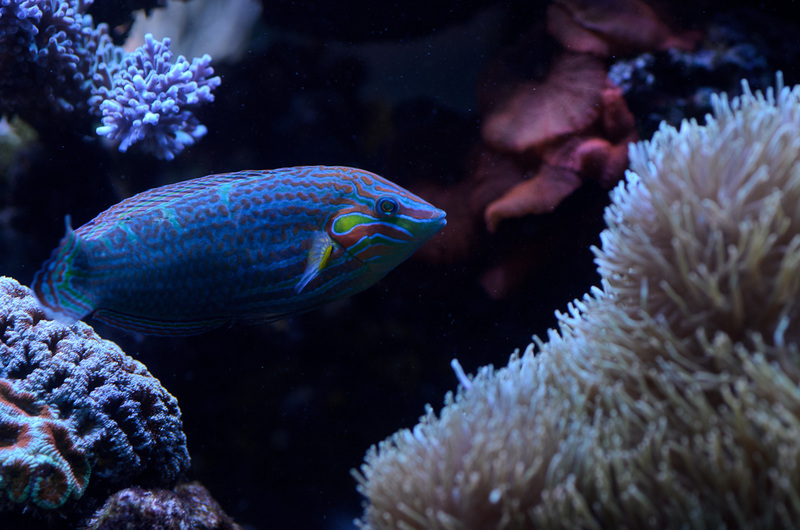 My Bluethroat Triggerfish are my favorite and exhibit the most personality. The male follows me around the room and I swear he’s smiling at me. I’m not going to attempt to list all the corals present in my tank. Suffice it to say that it is a mixed reef with softies, gorgonians, and many SPS. Reefers who keep careful track of all the corals they place in their systems have my due admiration. Someday I will get around to cataloging them all. Right now I can say that I try to achieve the most diversity that I can. That is the goal and my challenge. 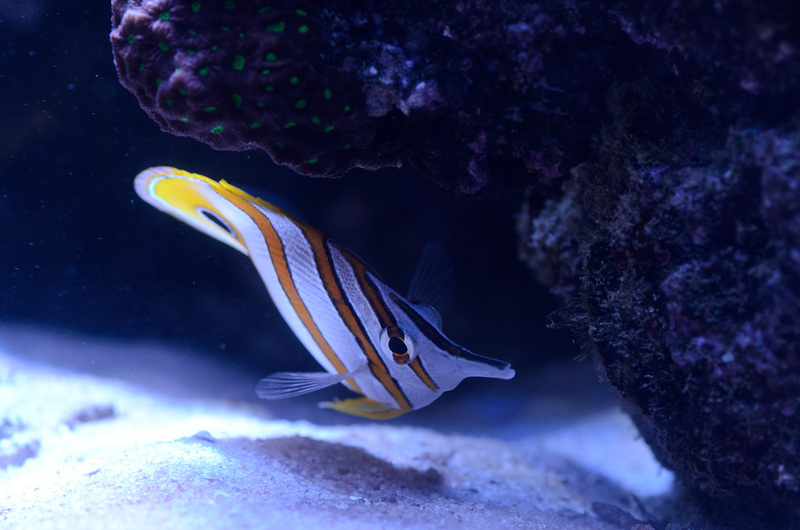 No reef tank endeavor would be complete without experiencing some of the common problems we all suffer through. I think I have had my fair share of all the plagues that are common to this hobby. Everything from cyano to red bugs, I have met them all. I have had AEFW present in the main display since at least 2008 and probably well before that. I control them now with wrasses and a turkey baster. 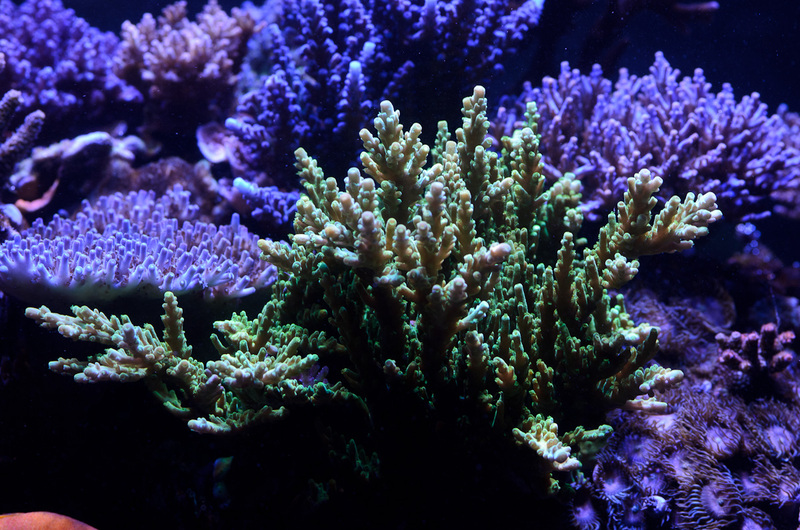 I cannot detect any damage to my corals, but I’m sure there would be if I let their populations increase. 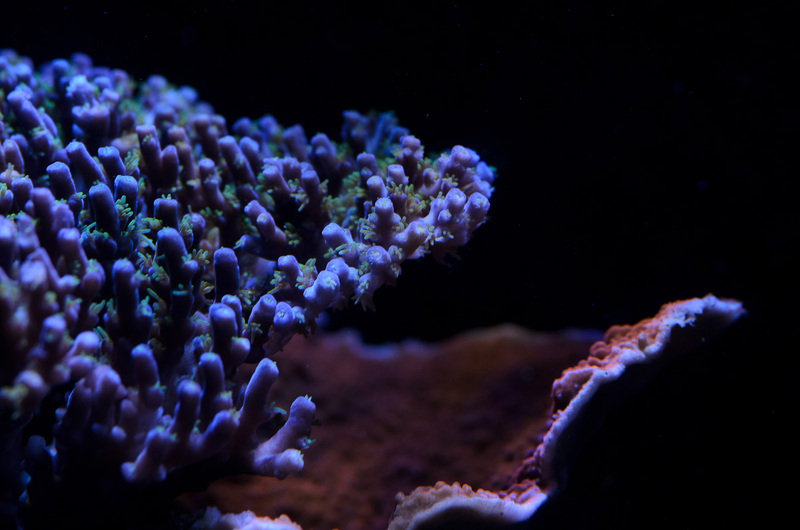 The worst effect of their presence is that I do not give out or sell any acro frags. I have listed the water parameters but the only testing I do on a regular basis is for alkalinity and iodine. Control System: Seavisions Dialyseas for water changes and control of specific gravity. Apex controller is used for heating, cooling, lighting of the ATS and alarms. I really love this hobby. There are so many different facets to it that keep you engaged and interested. If you are a tech geek, a biologist, chemist, a photographer or just someone that appreciates great natural beauty, there is something here for you. I never seem to tire of it. I would like to thank Leonard Ho for asking me to display my aquarium here. I would also like to thank Greg Thevenin for his tremendous help with the photography, and all of my friends and fellow reefers of the Boston Reefers Society who have made this hobby even more enjoyable for me. 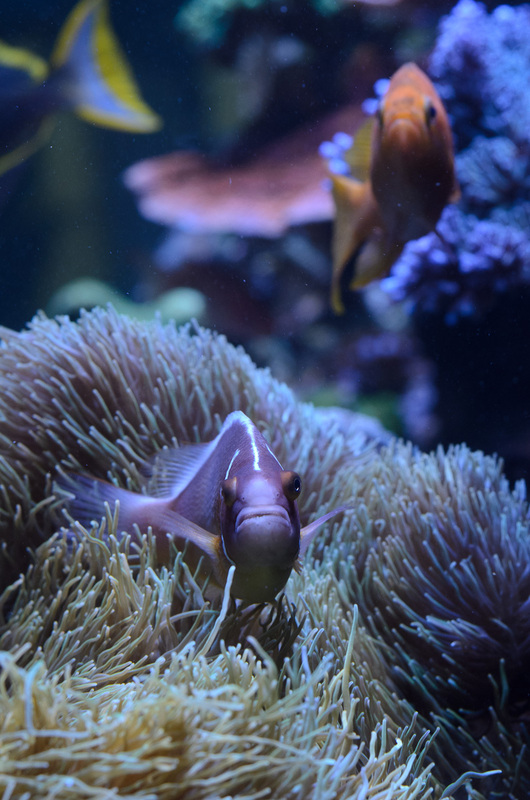 Here is a small sampling of the 100+ photos of Paul Bruns’ Feature Aquarium photo album. 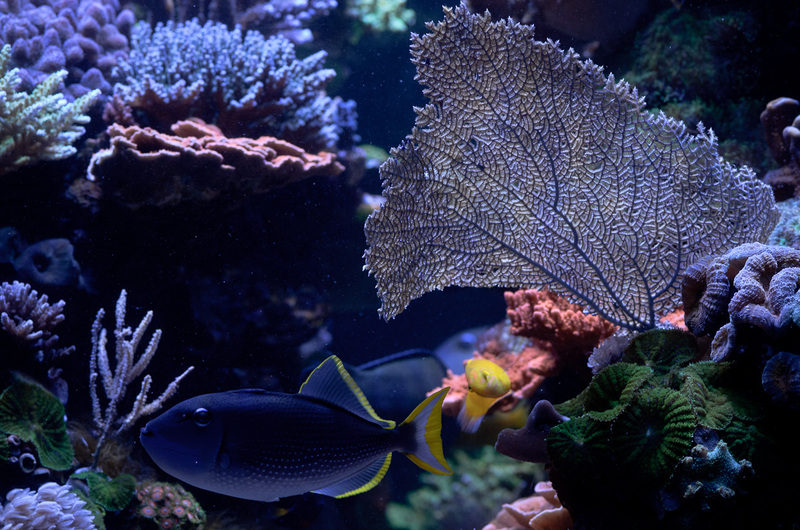 Click on the “view FEATURE AQUARIUM photo album” link below to see all the photos.